Is it short sighted, or policy? Drivers on the road between Erbil and Kirkuk must have been wondering. 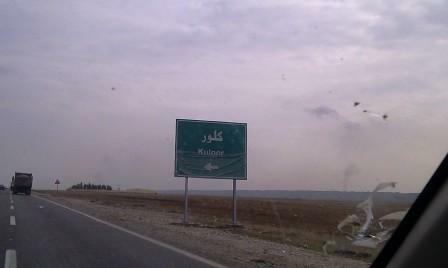 Why are the new traffic signs in this predominantly Kurdish region only in Arabic and English? The government in Baghdad decided that it was time for new signs. Drivers in Iraq need to know where to go, even though the roads often are in such bad need of repairs that you wonder if you really should use them. New traffic signs were made, and placed. Signs in Arabic and English. One language for the locals, the other for the visitors. Those signs are probably quite okay in the predominantly Arabic regions. But not in big parts of Kirkuk province, where Kurds form the majority. Here, you would expect a third language: Kurdish, which according to the Iraqi constitution is one of the official languages of Iraq. Even worse, Kurdish names are translated into Arabic. Erbil, or Hawler for the Kurdish, becomes Arbil. At the same time, this region is one of the disputed territories, over which the Kurds and Baghdad fight. The Kurds feel Kirkuk and the surrounding Kurdish area are part of the Kurdistan Region KRG, Baghdad wants them to remain with her. Are the traffic signs perhaps part of this fight? Are they a statement of Baghdad? That must be how local Kurds view them. Because suddenly an action group surfaced, painting over the Arabic on the signs, adding 'Speak Kurdish!' to make their message completely clear. Also in the city of Kirkuk, were Kurds now are the biggest group, the signs were targeted. Although the graffiti is written in Kurdish, the message must have gotten to the right places. A few weeks after the signs appeared, some of them have disappeared again: those that were covered with graffiti.The rest stayed - all the way between Perdi, where the river Zab is supposed to be the border with KRG, and Chamchamal, again the border to KRG. As a sore thumb to all Kurds that use the road. Yet this incident has two sides. 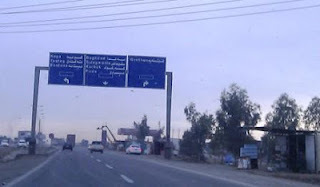 The signs in most of Iraqi Kurdistan are also mainly in two languages: only in Kurdish and English - and only in some of the cities Arabic has been added. The fight is fought at both sides. Traffic signs have become part of a political struggle. Perhaps the solution is to have signs all over Iraq in all three languages? Or would Iraqi's in Basra have a problem with that perhaps? Very interesting post Judit. In Wales the battle for bilingual (Welsh & English) roadsigns in the 1960s was one of the first campaigns of the Welsh Language Society to ensure status for the Welsh language. Many English only signs were painted with green paint in the campaign that lasted several years.